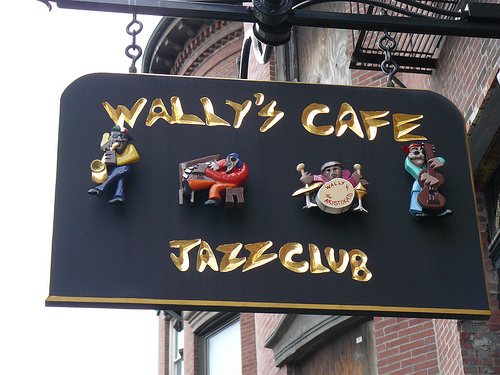 Wally’s has truly become a living link to Boston’s jazz heyday. At the time, the South End was home to predominantly African-American families and was the premier scene for Boston’s introduction to jazz music. Neighborhood nightclubs included the High Hat, Savoy Ballroom, Chicken Lane, Wig Wam, and Storyville (none which are in business today.). Poindexter’s grandfather, Joseph “Wally” Walcott, founded “Wally’s Paradise” in 1934 at 428 Massachusetts Avenue. He was a Barbadian immigrant who started the jazz club with the help City Council President Gabriel Piemonte and Mayor James M. Curley, both of whom he grew up with in Boston’s West End. Walcott founded the club because while African-Americans were permitted to perform in nightclubs, they were not allowed to attend. Walcott was the first African-American nightclub owner in New England. “He wanted to open a place where all kind of people can come together for live jazz music—black, white, whatever,” Poindexter states. “For Wally’s to sustain itself through those natural changes is a real tribute to the Poindexter family who kept it alive,” Quinlin says. Poindexter says part of why the institution survived is the influx of music students into the city each year. “The top young musicians in the world come here to get educated, and they’re gonna need a place to play. Wally’s is one of those places where they can develop their talent.” According to Quinlin, young people love to go to Wally’s because “it’s a hip place where you get a taste of what Boston is about and what it was about. “This place is a legitimate jazz establishment, and it’s really proactive that they give students an opportunity develop into the next generation of jazz legends,” Lauren Fisher, a Wally’s first-time visitor notes.